It often amazes me what some people are taught about the torso. Very often, we pianists just move in emotional response to the music as we play, without any awareness of where our hands are in relation to the rest of us. The torso is often ignored altogether. We all know the cartoon image of the virtuoso concert pianist: hands at an extreme register of the keyboard, arms somewhere else, the torso flung backwards with unassailable passion, preferably with untamed wild locks strewn hither and thither. Pianists who are conscious of the need for good posture often assume their “sitting straight” position at the keyboard. This frequently translates to sitting bolt upright, with the arms reaching for the keyboard, and accompanying upper arm fatigue. Yet playing the piano requires the torso to be a little more forward than the common understanding of “good posture”. In my experience, most people tend to sit with their weight balanced backwards away from the keyboard and playing hands. 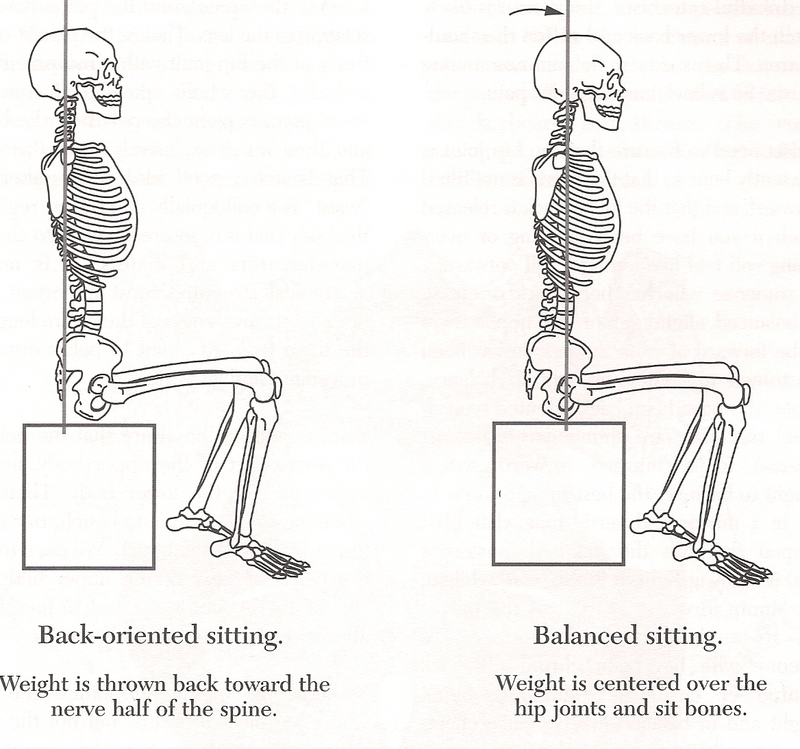 Back-oriented Versus Balanced Sitting (Mark, 2003, p. 49). © 1998, 2000 by Benjamin J. Conable. Distributed by GIA Publications, Inc.www.giamusic.com Used by permission. All rights reserved. Frequently, “sitting upright” is also linked to a fixed, inflexible position, no matter where those black dots fall on the page, rather than the constant and subtle adjustments required for every note. In these cases, I have learned to remind the students about how they move to pick up objects in daily life, asking them to grab the phone, pencil, or eraser close by, and asking them to observe how their torso responds by going with, just as it needs to at the piano. In some instances the pattern of remaining immobile is so strong that even moving to pick up an object with the torso responding feels unfamiliar, and that adjustment also needs to be trained. Some are warned of the dangers of playing like a penguin; and avoid the arms being too close to one’s torso. A more extreme version of this dogma is that the forearm and upper arms are never allowed to touch the torso while playing. In committed penguin-avoidance these pianists diligently practice holding out their arms as if there were a “pillow” between the elbow and torso, or are gracefully “poised” with the elbows held out, and resulting symptoms of fatigue, discomfort or pain in the upper arm, shoulder and /or neck area. Other theories include that the arms must be equidistant from the torso at all times, which can make many passages feel unplayable. Many students sit too close to the piano, and complain that playing across the body feels awkward and restricted. This is due to the elbow becoming trapped by the side instead of having the space to travel freely in front of the body. While it can be sometimes be helpful to ask if there are conscious strategies about the role of the torso, often students come from a history of multiple piano teachers and corresponding patchwork of conflicting ideas. Sometimes, there is no conscious training dictating the strange places their torso ends up inhabiting, they just have never learned how and when to move. Even when someone has an experience of great comfort when the torso is in a place to support both hands, the combination of previous training and habit means that they will frequently forget where to be, and will need reminding for some time. When one is trained as a teacher in this work, much of the process and students’ reactions become predictable. Pianists who tend to have a static torso will be surprised by how much and how often they have to move. Those who become aware of the excess movement in their playing are amazed by how their random lurching and circling takes them further away from the next destination, instead of closer. People will tend to yank the torso across at the last second for a scale crossing, yet move too early before a large distance, without truly being there for the last note before the leap. Those who were balanced back perceive the adjustment to being balanced forward as huge, and are shocked to see their mirrored reflection looking upright and normal. Sometimes kinaesthesia can play tricks on us, which is why a mirror in the piano studio can be invaluable. So where should the torso be? The torso’s location is context specific, which is where working with a trained Taubman teacher is helpful. It has to be in a place to support both hands, not just the hand with the melody. This constantly adjusts according to the demands of the passage, moving from the sitzbones, not the waist. I often come back to Edna Golandsky’s description that unless one plays the same note with the same finger, the torso will adjust in a small way. We’re talking tiny. The Taubman Approach has a whole vocabulary to describe the microworld of movement underneath a piano technique. Coordinating the torso’s adjustment with the moving hands and arms can immediately make a large difference to a pianist’s comfort at the instrument., with the playing fingers feeling more supported, more control, and therefore greater expressive possibilities. Where’s your torso as you’re reading this at the computer or on your device? Or when you are typing? The same rules apply.